Major Goodies for Weight-Loss Challenge Winners! You know what’s even better than getting healthy with your friends and family? Getting free swag for reaching your fitness goals! 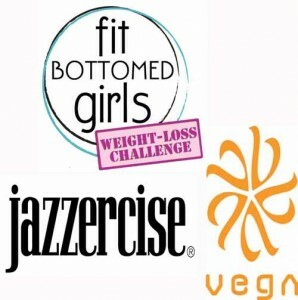 We are happy to announce that the awesome companies, Jazzercise and Vega, are the official sponsors of the January Fit Bottomed Girls Weight-Loss Challenges! Jazzercise (which isn’t your mother’s workout!) will donate a full-year membership to each team’s weight-loss winner, and Vega is donating a healthy snack bundle to each winner. The healthy snack prize pack includes two pouches of Vega Shake & Go Smoothie, three 12-count boxes of Vega Vibrancy Bars, a copy of Brendan Brazier’s Thrive, a reusable Vega shopping bag and a reusable Vega shaker cup. Not to mention FBG will be throwing in tons of other fitness goodies like workout DVDs, apparel, home equipment and other fun stuff.